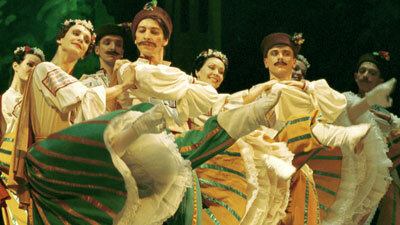 The Moscow Festival Ballet’s Wednesday night performance of Coppélia, despite the strength of its first two acts, was ultimately a victim of circumstance. Most modern performances of the ballet omit the third act’s wedding day divertissements, a choice that would have benefitted the Moscow Festival Ballet; Act III fell flat due to its lack of plot and to the company’s visibly waning energy. The first two acts highlighted the technical prowess and emotive skills of Marianna Chemalina as she danced the role of Swanhilde. Chemalina embodied the curiosity and playfulness of a young girl in Act I as she interacted with her suitor, Franz, and her gaggle of girlfriends. What Act II lacked in grandiose balletic vocabulary it demanded in its range of nontraditional movement qualities. Chemalina rose to the occasion, quickly shifting between doll-like rigidity and spurts of aggressive frustration. Act II also saw a much needed change in the embodied attitude of Swanhilde’s suitor, Franz, danced by Ruslan Mukhambetkaliev. Mukhambetkaliev abandoned his previously laborious demeanor when his character was offered a strong drink (or two). The danseur was soon stumbling across the stage, engaging with the audience in a way that nearly negated his uninspired performance in Act I. Though the principal dancers left a positive impact overall, the actions of two male company members jeopardized the integrity of the whole show. These dancers broke character at two separate instances, engaging in amateurish behavior that both distracted from the main action of the ballet and demeaned the audience’s experience. In Act II, the dancer playing the drummer doll appeared to be making faces across the stage in an attempt to provoke laughter from another posed dancer. Act III saw a similar type of unprofessionalism; the danseur playing one of Franz’s friends botched a jump whilst center stage and, upon landing, muttered something to the dancer next to him. Yet, it was not one dancer alone that made Act III crumble. Though the act’s choreography was well executed, it seemed superfluous and self-indulgent, a notion that the dancers appeared to share. The further the act progressed, the more the performance quality waned; the show’s final moments failed to replicate the “big bang” that audiences have come to expect from traditional ballet performances.